Summary: Pictures in this gallery are from a three-week long trek in the Dolpo region in September 2008. 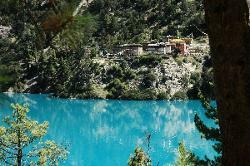 For the travelogue and itinerary, see my Dolpo travelogue. 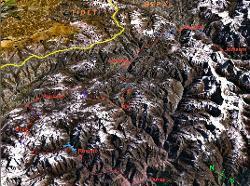 Map of Dolpo in western Nepal. 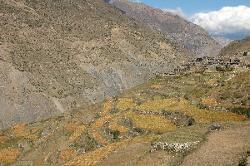 Map of Dolpo with passes, villages and routes. 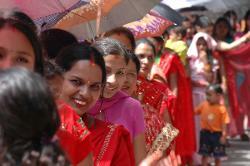 Many smiles while waiting in the long, long line. 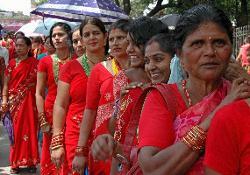 Colourful dresses at the Tiji festival. 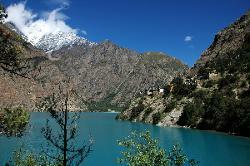 Getting to the start of the trek is an adventure for itself, luckily the weather is fine and we land safely and without a delay at Juphal airport. 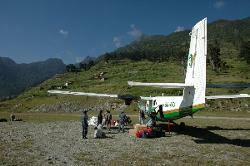 Sometimes people get stuck in Nepalganji for days until the weather clears. 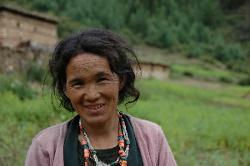 An easy first day of walking from the Juphal airport to Dunai takes us through lush terraces of corn and wheat. 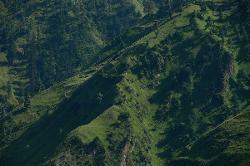 Hillside near Dunai turn into an intense dark green in the late afternoon. 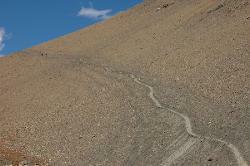 Nothing like a steep climb to get in shape at the beginning of a trek. 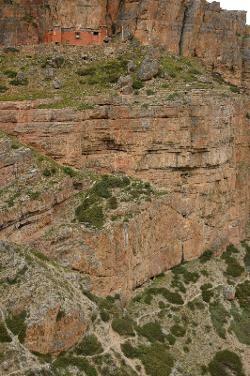 We leave Dunai and take the high-route up the Suli valley towards Ringmo. 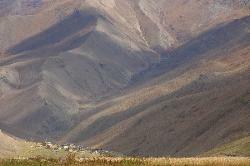 Our first glimpse of the high mountains of Upper Dolpo on our second day up the Suli gorge. 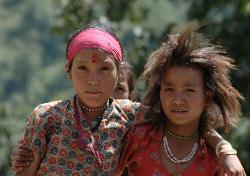 Life in the middle hills is very hard for the Magar community. 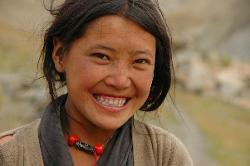 We take the high route to Ringmo and are greeted with smiles in the small villages. 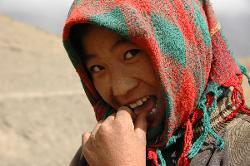 Young girl in one of the villages above the Suli river. 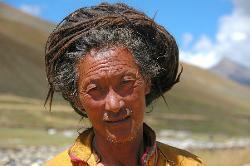 There's also less wild hairstyles in Rohagoan. 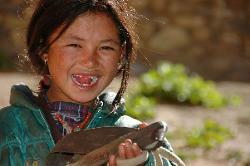 Taking a break from hard work. 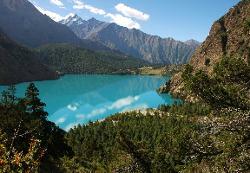 The Soligad creek below comes from the turquoise Phoksumdo lake. 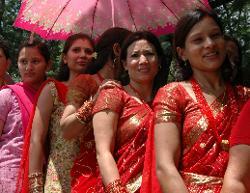 In Rike we are invited inside for a cup of tea. Beware of etiquette, you have to accept refills as a polite guest. 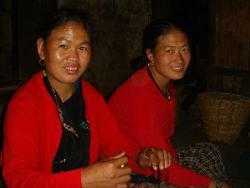 Sitting in the simple but cozy living room in Rike and gossiping in broken Tibetan. 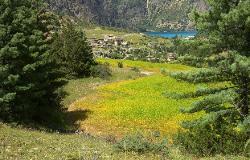 Yellow buckwheat fields add a great contrast do the blue colour of the lake. 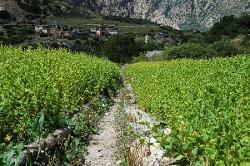 A small trail takes us through buckwheat fields to Ringmo, a large village. 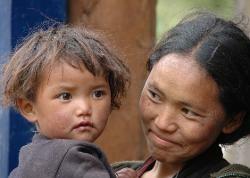 Mother and her daughter in Ringmo. 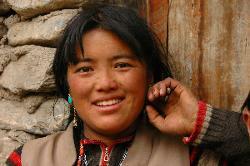 Video of Ringmo in Dolpo, the lovely village and its great surroundings. 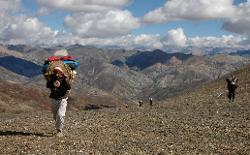 If one picture is to show the rewards for tough hiking for days and days - this is it. 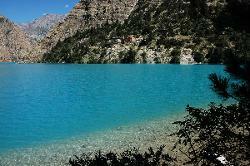 In the morning the sun reveals blue and turquoise tones that are strictly separated by the shade. The trail drops down towards the lake, the splashing of tiny waves and the chirping of birds complete the picture of harmony. 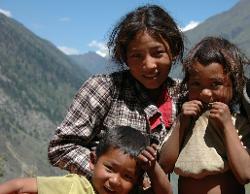 Despite the idyllic surroundings, one shouldn't forget that life for people of Dolpo (and Nepal in general) is very hard. 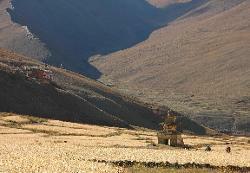 Catching a glimpse of the monastery through the lush vegetation at 3'500 meters above sea level. 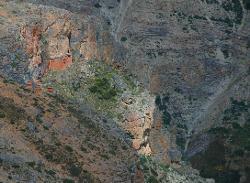 Monastery of Ringmo with Kanjiroba rising in the left. 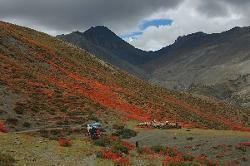 A climb up from the monastery into the valley above reveals an alpine meadow with dozens of different flowers. 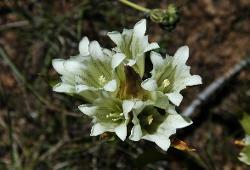 "White gentians" in Ringmo Dolpo Nepal. 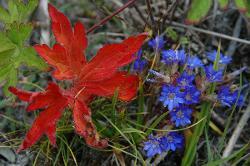 Clustered summer gentian contrasted by red leave, near Ringmo in Dolpo Nepal. 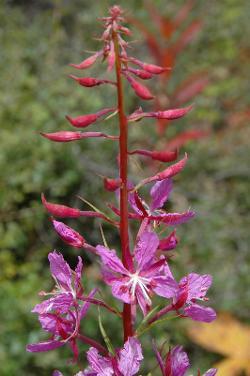 Low-growing trailing bellflower near Ringmo in Dolpo Nepal. 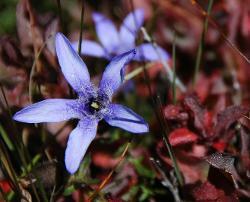 Slender lousewort near Ringmo Dolpo Nepal. 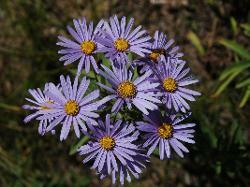 Himalayan Fleabane near Ringmo in Dolpo Nepal. 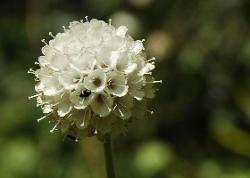 Flower near Ringmo in Dolpo Nepal. 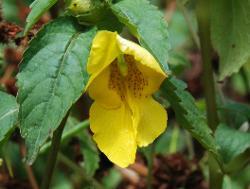 Rugged yellow balsam near Ringmo in Dolpo Nepal. 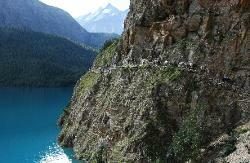 A narrow trail goes along the lake. 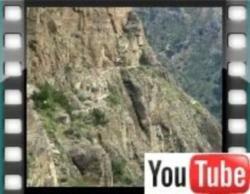 It looks challenging for us, how will the horses get across there? 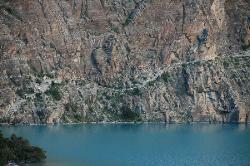 Trail above the lake, often it's a vertical 30, 50 feet down into the cold water. 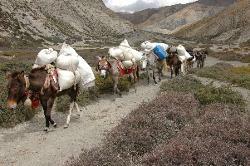 The horses are unloaded but don't have any problems on the trail. 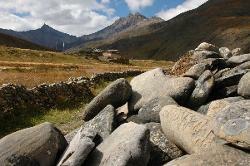 The art of trail-making in the Himalayas is hundreds of years old and produces stunning constructions of stone, as seen here where rocks are piled to support the overhanging trail. 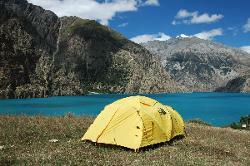 How can trekking be any better as on the gentle parts along the Puksumdo lake. 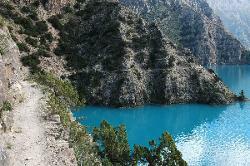 We cross a lovely alluvial fan covered by pines. 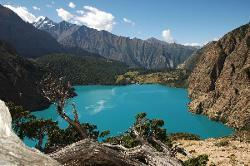 View back to Ringmo at the southern shore of the Phoksumdo lake. 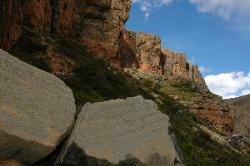 Jamie looking back to Ringmo and the narrow trail carved out of the sheer rockfaces. 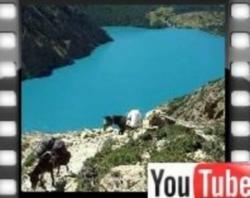 Video of the high trail above the lake on the way to Shey. 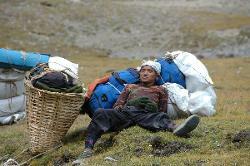 Short nap after lunch on the way to Shey. 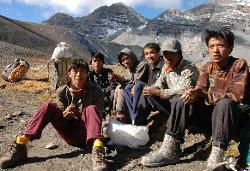 Also the porters enjoy a much-deserved rest after a hard morning walk. 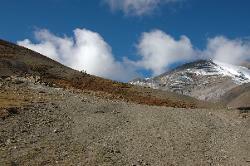 Clouds move in as we climb higher on the way to our first high pass. 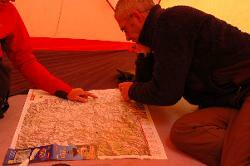 Studying the map before going to bed: what will tomorrow bring? 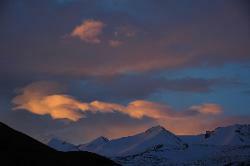 Early light hits the mountains on the way to Shey. 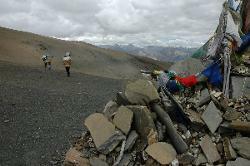 On the way to the first pass just to the right of the rocky summit on the horizon. 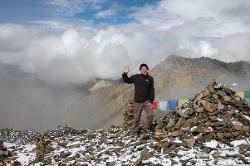 At almost 5'000 meters on the way to Mentok Ting La pass. 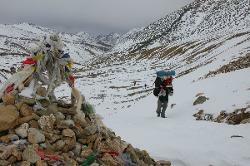 Pass #1, Mentok Ting La West, though it also seems to be called Kang La West on maps. 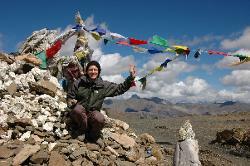 It's further north-west than the pass taken by most tourists, and reveals great views into Upper Dolpo. 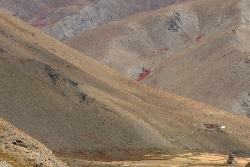 Looking from the Mentok Ting La pass into the true Upper Dolpo and the Tibetan border. 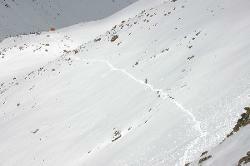 Video of precipicous trails we take to get to Shey. 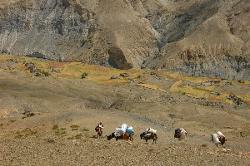 The horses had to walk over the hillside. 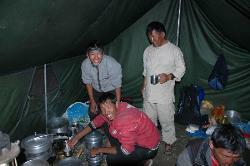 Kitchen crew on the way to Shey, a tiny settlement with a well-known monastery. 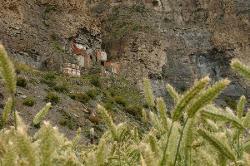 Tsekang monastery lies an hour above Shey and clings to the vertical cliff like an eagle's nest. 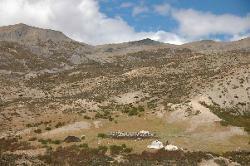 Tsekang Dechen monastery is an impressive sight from all directions. 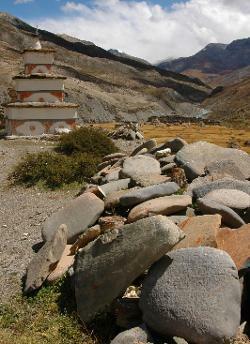 Mani walls below the Tsakang gompa near Shey. 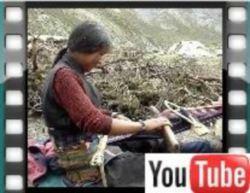 Video of young woman weaving in Shey, she lives in Saldang but comes to meadows near Shey and weaves to generate additional income. 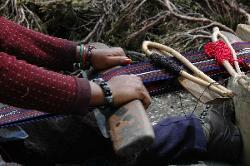 Weaving in Shey, most people move with their cattle in summer time to pastures outside of their village, and live in tents during the time. 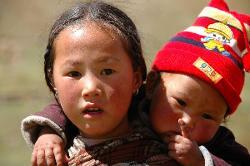 Men are often away on trade in summer and visit Tibet, women are left in the villages and take care of babies during their daily chores. 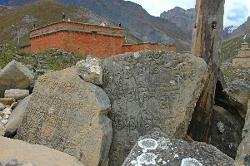 The famous monastery of Shey in the early morning. 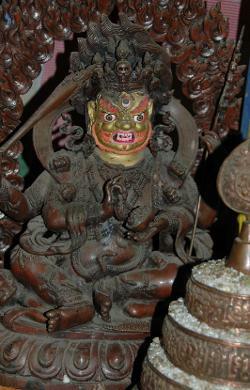 We find the caretaker and he opens the door of the assembly hall of Shey's gompa. 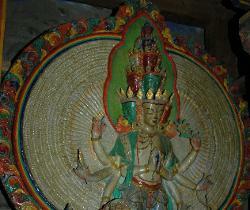 Protector deity in the monastery. 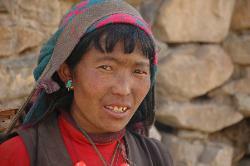 We leave the picturesque Shey behind us and walk to Namgung that lies a day further to the north-east. 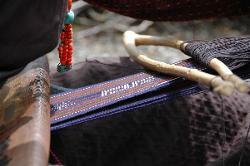 Pass #2, Gela La and also called Namgung Bhanjyang. 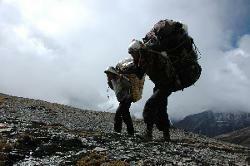 Kitchen crew descending from the Gela La into the barren valleys of Namgung. 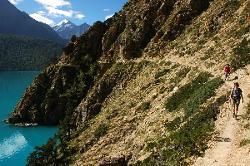 Looking back to the Gela La in Upper Dolpo. 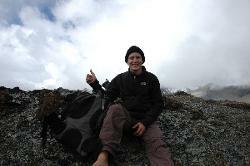 Once again we had an excellent crew, working hard and seeming to enjoy the trip as much as we did. 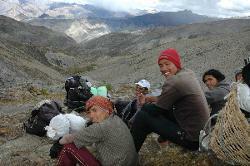 Crew taking a short break. 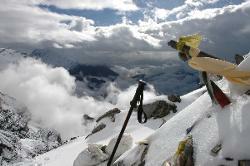 On top of the world you can touch the clouds. Weather changes quickly, incredible but true we only walked half an hour in rain during the entire trek, but often came to enjoy majestic clouds and bursts of rain from a safe distance. 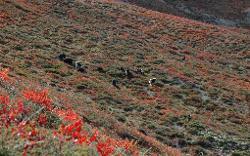 Near Namgung red bushes dotted the hillsides which contrasted starkly with the dark barren slopes above. 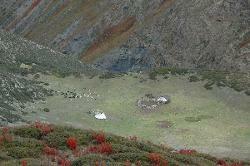 Nomad tent with stone cage to protect the valuable goats safe from predators are night. 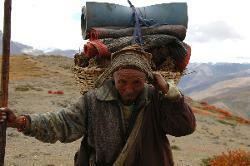 Old gentleman on the way to his house in Saldang to drop of the yak dung that heats the houses in winter. 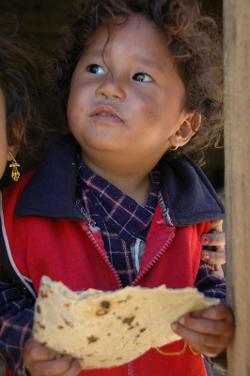 Shy young girl from Saldang. 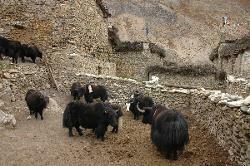 Yaks roam on the hillsides on their own. 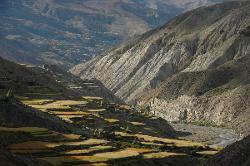 Look down into the Namgung valley where a few terraced barley fields make survival for the small village possible. 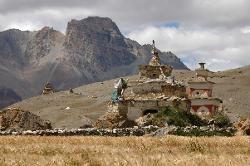 Abandoned monastery of Namgung above the barley fields. 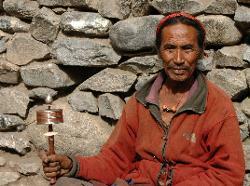 The caretaker opens up the monastery for us. 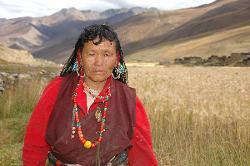 Nomad with fierce watchdog on way to Saldang whose yellow barley fields stand out of the ochre barren hillsides. 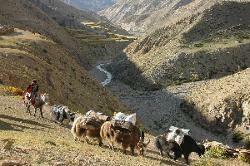 Suddenly the fertile valley of Saldang appears at the bottom of the valley. 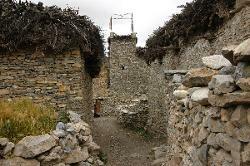 The stretched out village is very picturesque. 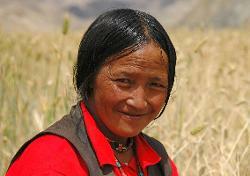 Woman from Saldang takes a short break from harvesting the barley. 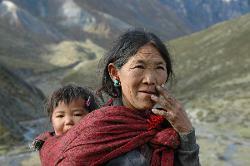 We leave the main village of Saldang but pass many others during the rest of the afternoon. 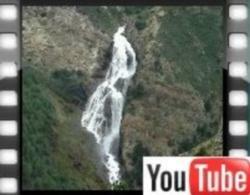 Wonderful walk in the valley. 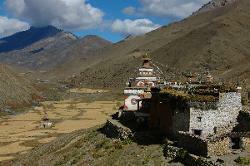 High above the valley stands a monastery. 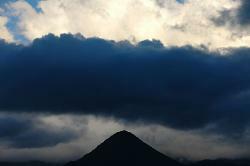 In the late afternoon the setting sun replaces color with shape. 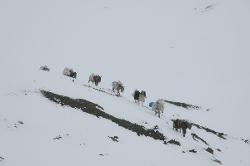 Yak caravan on the way to Do Tarap. 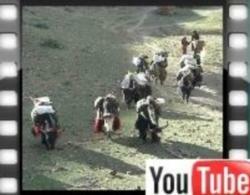 Video of yak caravan in Upper Dolpo near Saldang. 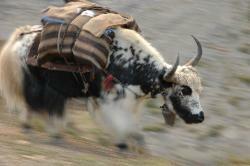 Loaded yak, the animals can be fast if they want to and keeping a safe distance isn't a bad idea. 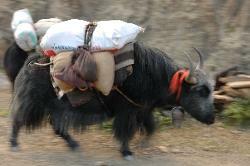 Another yak carrying a small load. 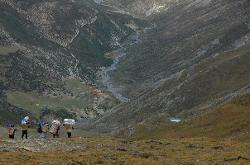 Our caravan on the way to Do Tarap, trying to find the pass. 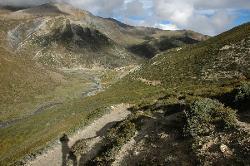 On the way to the Do Tarap valley, there's definitely a trail though the pass we were supposed to take is much further to the left. 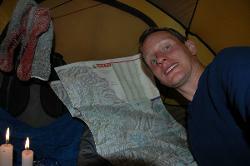 Despite all natural highlightes during the hiking day, dinner is always another highlight. 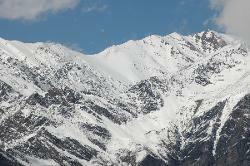 Great morning for crossing 2 high passes into the Tarap valley. 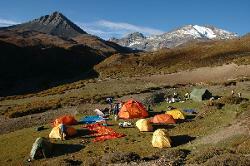 Everybody made it well through the night at "diamox" camp where we stayed at high altitude. 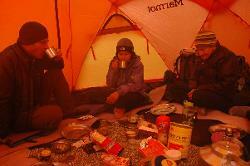 It is certainly much colder than on previous days and the hot chocolate highly appreciated. 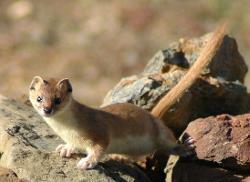 Himalayan stoat at an altitude of almost 5'000 meters. 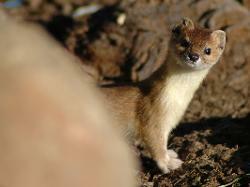 Curiously watching us tourists but always ready to run. 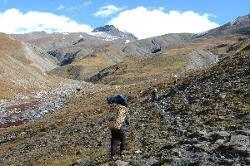 Up the barren slopes towards our third high pass, the Langmosia La. 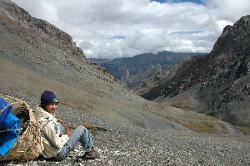 Short break before the last part towards the pass. 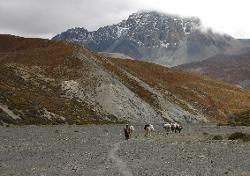 Looking back towards the Saldang valley. 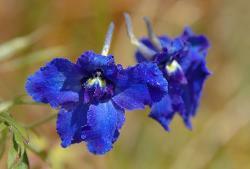 Pass #3, the Langmosia La. 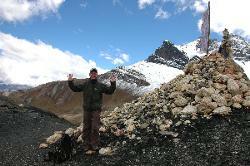 Pass #4, the Chang La, with Langmosia La just above the left hand. Two passes in one day, not too difficult because they are close to each other but the way down to Do Tarap is quite a stretch. 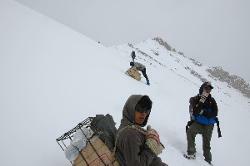 We descend on a barren slope down to lower altitudes. 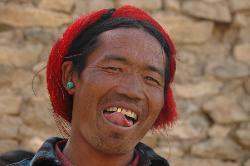 Finally, after a long day, the valley of Do comes in sight. 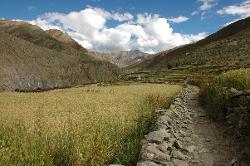 Looking back towards the Chang La as we finally arrive in the Tarap valley. 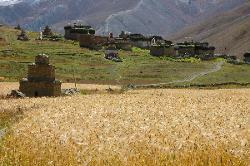 Barley fields in Do Tarap. 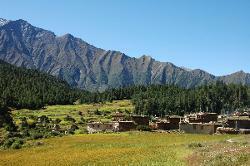 The monastery above Do village in the Tarap valley is visible from far away and stands out on the ochre hillsides. 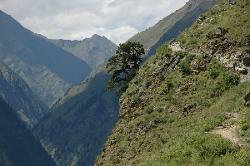 Looking up the Do Tarap valley. 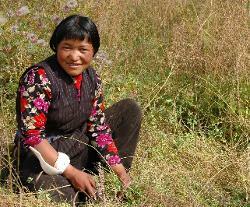 Summer brings much work, here grass is being cut for winter-fodder. Taking a break from cutting grass to chat. 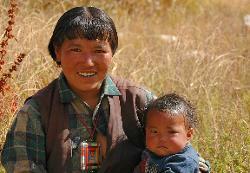 Mother with child in Do Tarap. 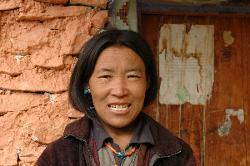 Portrait Do Tarap with traditional jewellery. Nobody too small to be a babysitter. 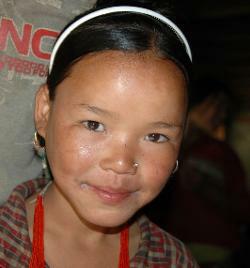 Portrait of young girl in Do. 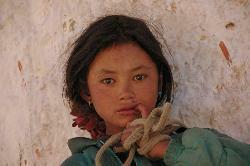 Portrait of young girl in Do who opens the door to the monastery. 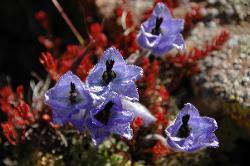 Musk larkspur looks very delicate but survives the cold nights at 4'500 meters quite well. 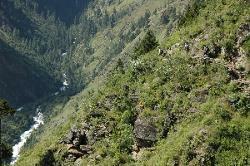 On the way to the lower part of Tarap valley where we branch off towards Charkha. 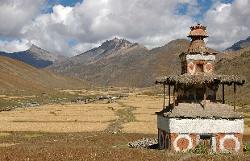 Chorten and monastery of Do. 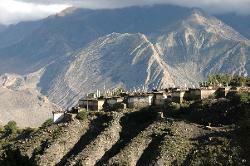 Chorten and houses of Do. 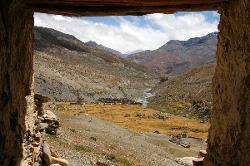 View from Do monastery up the Tarap valley. 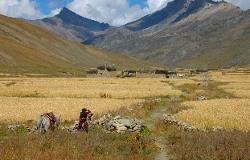 Trail goes through golden barley fields to the small village of Shipchok. 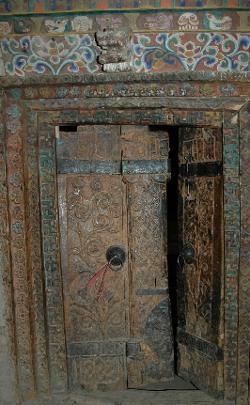 Wooden door to Shipchok's monastery, one of the few Bon monasteries remaining. 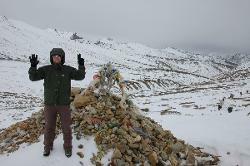 On the way to Chakoed La with a little snow for decoration. 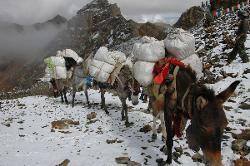 Mules and horses don't have trouble with snow or altitude, amazing animals. 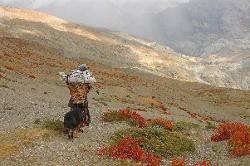 On the plateau of Chakod La pass. 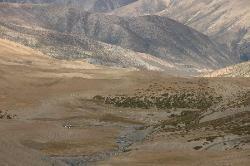 Approaching yet another pass that will take us into the Charkha valley. 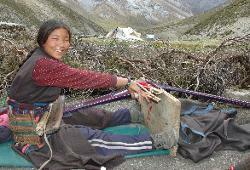 People from Charkha also go to high pastures during summer. 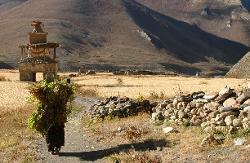 Tourists are rare in this part of Dolpo. 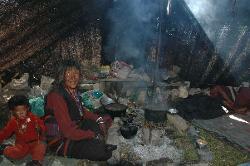 Inside a nomad's tent, life is harsh and not as idyllic as we might think. 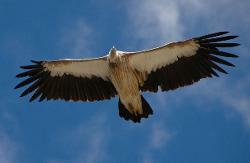 Himalayan griffon are huge, and sometimes fly quite low. 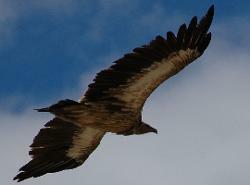 Kings of the sky, Himalayan griffon near Charkha. 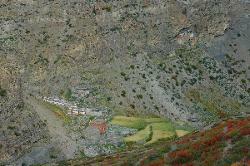 View of Charkha village and the fields that surround this remote settlement. 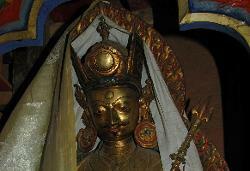 Mani wall and chorten of Charkha. 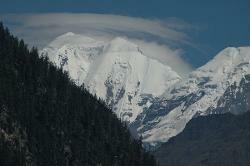 Looking back from Charkha towards Mola pass. 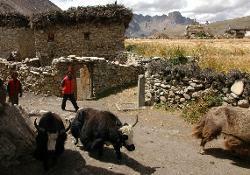 Yaks being driven into the village. 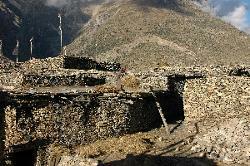 Charkha feels more like a fortress than a village. 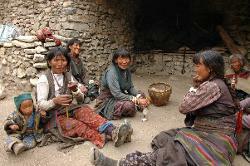 The women gather for an afternoon chat with parallel spinning and weaving. 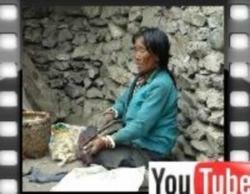 Video of village life in Charkha. 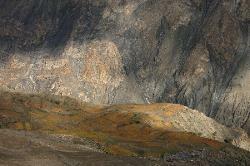 Strange light in the morning announces a day of foul weather just as we leave for the difficult pass into the Sangtha valley. 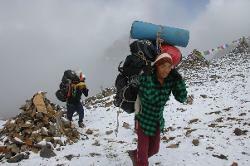 On the way to the Sangtha valley bad weather and snow surprises us. Pass #7, name not known to me. 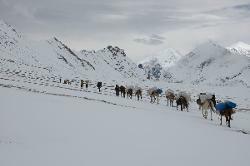 On the way to the crest at the left, horses having trouble in deeper snow. 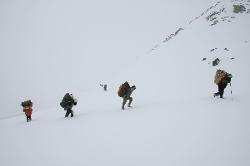 Climbing the steep, snow-bound hillside towards the pass. What a mission day - the strong ones (which doesn't include me) break trail on the way to pass #8 which we've almost reached. Everybody is struggling and fighting with exhaustion. 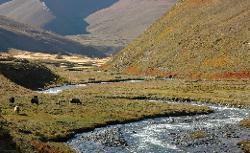 Where are the horses, and how can they possible make it up and over the pass? 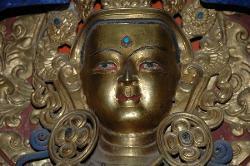 Pass #8, Sangtha La. 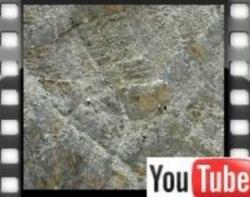 The most difficult one, even under normal conditions. 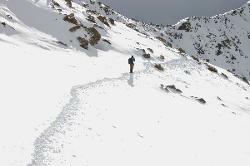 A steep descent, but snowlevel doesn't get lower. 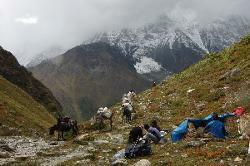 It's a miracle but the horses made it over the pass. 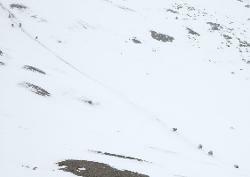 They will spend a freezing night outside and have to descend steeper snowfields tomorrow - the horsemen are about to have a nervous breakdown but going back isn't an option either. 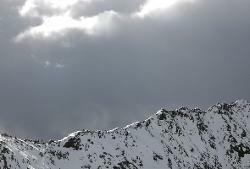 After a rough night we were lucky and not too much new snow fell, the weather has cleared a little and we can attempt our last high pass. 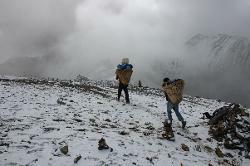 The crew broke trail already and carried many loads because horses can't carry anything in these conditions. 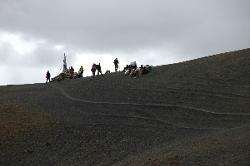 The crew waiting on the crest that marks pass# 8. 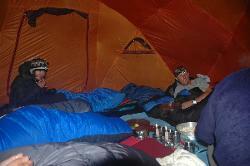 There not enough flat space so we put up a the dining tent as a dormitory. Frankly speaking, most (all?) of us are so exhausted that we're just happy to rest. Looking back towards our camp where we managed to put up only the kitchen tent and the dining tent where everybody slept. 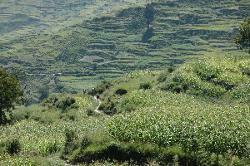 Looking down into the Sangda valley where bad weather seems brewing already - luckily most clouds disappear soon afterwards. 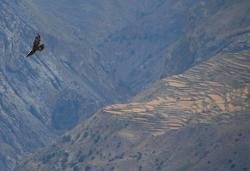 Eagle flies over the Sangda valley with the village and fields in the background. 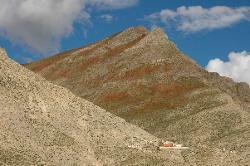 It looks temptingly close, but will be quite a hike to get there. 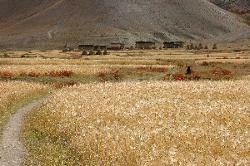 Sangda valley with harvested buckwheat and barley fields. 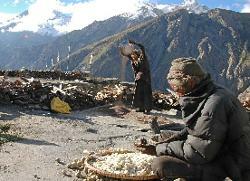 Summer is spent on the roof where turnips and mustard oil are being prepared. 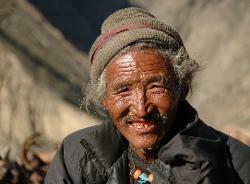 The village of Sangda is very remote, history says that an entire family was expelled from the kingdom of Mustang and had to settle in the Sangda valley. 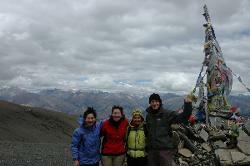 From Sangda we look back to the passes we crossed yesterday. 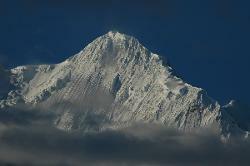 Another group is descending right now from the dip in the highest range, we meet them by coincidence in Pokhara three days later and they really suffered. 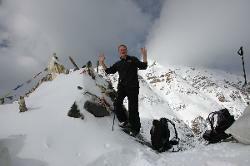 First I took them for climbers on Dhaulagiri and was a little surprised that it was Sangda La that completely worn them out. 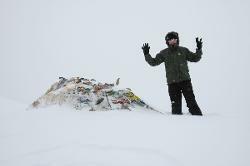 Pass #10, not our highest but the last of our passes and therefore still a good reason to celebrate. 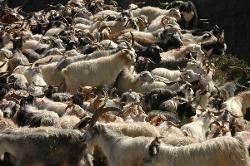 For the Hindu festival season goats are brought all the way from Tibet into Nepal's heartland - prices are rather high and even up here a goat already costs $100. 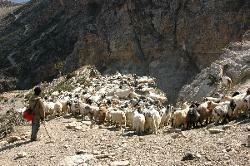 Thousands of sheep are driven down on the small trails today (and on any other day the next week), at narrow spots a traffic jam forces us to wait and be careful - these animals create rockfall. 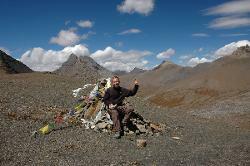 It is a great idea to escape the crowds of the Annapurna Circuit and stay on the high route, therefore we camp in the interesting Dangarjong (Dakar-dzong). 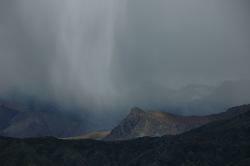 Rainstorm looming over the Kali Gandaki valley near Jomosom. 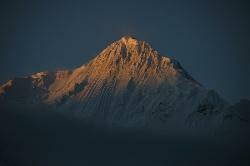 Nilgiri north face just at sunrise. 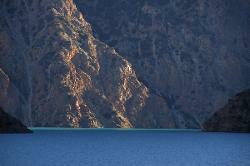 A few minutes later, half of the steep flanks of Niligi are already in orange light. 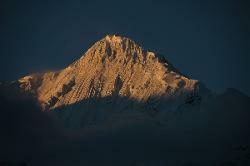 Nilgiri north face in the morning light just after sunrise. 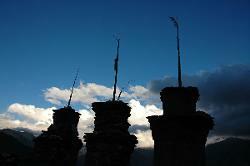 Chortens against the approaching night sky. 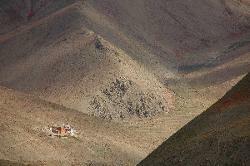 Goodbye Dolpo, hopefully I'll have another chance to visit and explore those corners that we missed during this fantastic, 4 week long trek.